Humanists UK has responded to a consultation on the introducing a public spaces protection order (PSPO) in the vicinity of the Marie Stopes Clinic in Ealing. This measure aims to create an activist-free zone around the clinic allowing women seeking an abortion and staff to access the clinic without fear of harassment and intimidation by anti-choice protesters. Although Humanists UK supports the introduction of PSPOs around clinics as an effective interim measure, it has also called new national legislation to protect women accessing safe and legal abortions across the UK. The PSPO proposed by Ealing Council will create a ‘safe area’ around the clinic in which activism related to abortion cannot take place, so that women and staff accessing the clinic have a meaningful choice about whether to engage with activists and are not forced to encounter them if they choose not to. It also creates a ‘designated area’ away from the entrance of the clinic in which activists may be present and display anti-choice messaging. Humanists UK is a founding supporter of the Back Off campaign, coordinated by BPAS, which aims to change the law to make it possible to establish buffer zones around clinics. 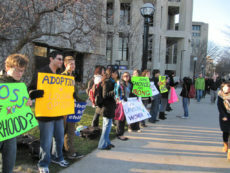 The campaign was established due to an intensification of anti-choice protests around clinics. At such protests, anti-choice activists have accosted women without solicitation, shouted abuse, exposed them to distressing and graphic images, in leaflets and on large banners, filmed people entering and leaving clinics without their consent, and blocked the entrances to the clinics. Humanists UK believes that the introduction of buffer zones balances the competing rights between women accessing safe and legal medical services without being harassed and intimidated for doing so, and those of the anti-choice activists to freely express their views. Such measures would make it possible for women to access clinics without being subjected to unsolicited approaches from activists whose primary intention is to cause distress when they are undertaking an emotional and significant decision. They measure don’t ban or in any way prevent anti-choice activists from organising such activities, but offer women a meaningful choice about whether they wish to engage with these activities or not.